Street Sharks is an American-Canadian animated series about the adventures of crime-fighting half-man/half-sharks. It was produced by DIC Productions L.P. and aired from 1994 to 1997, originally as a part of the Amazin' Adventures lineup. Later, in 1996, the Street Sharks teamed up with the Dino Vengers and the show became Dino Vengers Featuring Street Sharks. It was created to promote an existing Mattel toy line of the same name. The creators were David Siegel and Joe Galliani of Mr. Joe's Really Big Productions. The final few episodes introduced the Dino Vengers: a group of extraterrestrial dinosaurs allied with the Street Sharks against their own rivals in the Raptor Gang. When Dr. Paradigm wanted to get a sample of the Raptors' DNA to improve himself, they trick him by giving him iguana DNA which transforms him into "Dr. Iguanoid" leading to him working with the Raptors where they will reward him by correcting the DNA mistake they gave him. In the end, Paradigm is captured and imprisoned while the Raptor Gang leaves Earth. The Dino Vengers later had their own series called Extreme Dinosaurs where they and the Raptors had different backgrounds. A screenshot from the first episode, "Sharkbait." Clockwise from upper left: Jab, Streex, Big Slammu, Ripster. Ripster (voiced by Lee Tockar) - John Bolton is the smartest, the leader, and oldest of the four brothers who enjoys creating inventions. He has taken up most of his knowledge and skills from his father. He is also an avid pool player. In the first episode of the show, John rides a motorbike. When transformed into Ripster, he becomes a great white shark able to bite through steel, as well as having extrasensory abilities. Jab (voiced by Matt Hill) - Clint Bolton is the laziest of the Street Sharks, but enjoys boxing and appears to have some talent with mechanics. When transformed into Jab, he becomes a Scalloped hammerhead shark and uses his head as a battering ram. Streex (voiced by Andrew Rannells) - Robert "Bobby" Bolton Jr. is a level-headed, cool and self-proclaimed ladies' man. He is always shown wearing his rollerblades and appears to enjoy parachuting and snowboarding and later plays drums professionally. When transformed into Streex, he becomes a tiger shark, named after the purple streaks on his body. In the toyline, he was originally called "Blades" for his skills as a rollerblader. Big Slammu (voiced by D. Kevin Williams) - Coop Bolton is the strongest and youngest of the four. He is also a football player in high school. In the first episode, he uses a skateboard. When transformed into Big Slammu, he becomes a whale shark and his most prominent maneuver is the "Seismic Slam" in which he may shake or crack the ground with his fists. Dr. Robert Bolton (voiced by D. Kevin Williams) - A university professor and the father of the Bolton Brothers who invents the gene-manipulation device for peaceful uses. He is only seen on-screen in the first episode where he tries to stop Dr. Paradigm's experiments only to become changed into an unseen inhuman creature. Afterward, he is only ever represented by a shadow cast on the wall. It is suggested through the series that Dr. Bolton secretly assists his sons. The episode "Shark Source" shows him defeating Dr. Piranoid to rescue a kidnapped mutant crocodile. Despite the fact that he helps them, Dr. Bolton is never reunited with his sons. However, he does contact his sons through a TV screen where the transmission keeps even the viewers from seeing his current appearance. Sir Thomas Bolton - An ancestor of the protagonists who is encountered in the episode "Sir Shark-a-Lot". He is the target of Paradigm's time-travel excursion to destroy the Bolton family. Lena Mack (voiced by Pam Carter) - A student of Dr. Paradigm's who suspects him of crime, and therefore assists the Street Sharks. She is later reduced to a background role and has a younger brother named Malik. Bends (voiced by Jim Hoggatt) - Fission University's technical genius and a source of comic relief who supplies the Street Sharks with their motorbikes and weapons and conceals them underneath the University's ice skating rink. In episode 16, it is revealed that he cannot be mutated by a gene-slamming airborne virus. This genetic trait was passed down to his great, great, great grandson who is a member of the resistance against Dr. Paradigm in an alternate future as seen in "Shark to the Future". Moby Lick - Jets Taylor is a good friend of the Bolton Brothers and Bends. Under Dr. Paradigm's mind-control, Jets is combined with a killer whale by Dr. Paradigm in order to make him his latest Seaviate. Becoming Moby Lick, he later broke free of Paradigm's mind control and became an ally of the Street Sharks. Moby Lick has a long prehensile tongue (the source of his name), great strength, and the ability to inhale water and expel it through his blowhole; and later demonstrated the ability to communicate with other killer whales. In "Shark Hunt", it is revealed that Moby became an eco-conservationist in the Everglades National Park. Rox (voiced by Lee Tockar) - Melvin Kresnik is an up-and-coming musician mistakenly combined with a bull shark who exposes Dr. Paradigm's plan to change Kresnik's audience into mutants. Thereafter, Rox continues as a rock star by explaining his altered form as a costume and remains a friend of the Sharks. He was dropped from the series after Season Two. In the toyline, Rox is labelled as a mako shark instead of a bull shark. President David Horne (voiced by Tony Wike) - The President of the United States. The Street Sharks save from Dr. Paradigm before he can be "gene washed" like he did with Vice-President Russell. Following this incident, President Horne secretly leaks information to the Street Sharks. El Swordo (voiced by Garry Chalk) - A circus performer who worked with a large marlin named Spike. The two were eventually "fused" together by Dr. Paradigm resulting in a combination of memories under the man's personality. El Swordo remains active in entertainment as a professional swordsman. Mantaman (voiced by D. Kevin Williams) - A flying dinosaur-like alien specimen was found encased in stone by Dr. Terrence "Terry" Morton and reactivated by Dr. Paradigm. Dr. Morton then deliberately gene-slammed himself with a combination of the alien's DNA and manta ray DNA to help the Street Sharks fight the original alien. He has a younger brother named Ryan who appears in "Shark Jacked" when he gets captured by Dr. Paradigm. By the end of the episode, Mantaman's parents learn of what became of their son and accept his appearance. Around the "Ancient Sharkonauts" episode, Mantaman returns under the control of the Raptors when it was revealed that they were behind the flying dinosaur-like alien whose DNA is part of Mantaman. He is later liberated by the Street Sharks. Dino Vengers - A military unit from an exoplanet inhabited by anthropomorphic dinosaurs. Allied with the Street Sharks. Once ordinary members of their race, the four volunteered to receive genetic enhancements that made them far larger and stronger to better combat Bad Rap and his gang of terrorists. T-Bone (voiced by Ian James Corlett) - A Tyrannosaurus and the leader of the Dino Vengers. Stegz (voiced by D. Kevin Williams) - A Stegosaurus. Bullzeye (voiced by Ian James Corlett) - A Pteranodon. Spike (voiced by Garry Chalk) - A Triceratops. Dr. Luther Paradigm (voiced by J. Michael Lee) - The main antagonist of the series and arch-enemy of the Street Sharks. A professor at Fission City University, he is easily identified by his metal eyepatch and later by a giant yellow robotic exoskeleton, with offensive capabilities including the ability to fire harpoons. In the second episode, Dr. Paradigm is injected with piranha DNA meant for the Street Sharks who nicknamed him Dr. Piranoid. Afterwards, Paradigm's face assumes inhuman attributes at moments of strong emotion. When in public, Dr. Paradigm wears a robe to hide his exoskeleton. When Dr. Bolton defeated Dr. Piranoid to rescue a captive mutant crocodile and damaged his armor, it was shown that parts of his body was fish-like. During episodes featuring the Dino-Vengers, Dr. Paradigm injected himself with iguana DNA which was given to him by the Raptors instead of Velociraptor DNA and was renamed Dr. Iguanazoid as a result. He has since helped out the Raptors with their plots hoping that they will actually give him Velocirator DNA. By "Shark-apolypse Now!," Dr. Iguanazoid is apprehended by the Street Sharks. SharkBot (voiced by Steve Gibbs) - Dr. Paradigm's experimentation with robotics. It was used to free the monster Repteel from prison and frame the Street Sharks for the crime. The Sharks ultimately reprogrammed SharkBot to destroy Paradigm's laboratory. SharkBot was later rebuilt into SharkBot 2.0, which fought the Street Sharks until the end of the series' second season. Tentakill - A biped creature of unknown origins and species, first seen in the episode "Sir Shark-a-Lot" as Paradigm's newest weapon. It is incapable of speech, shows limited intelligence, and was not utilized often. Seaviates - A group of mutant sea creatures that serve Dr. Paradigm. Slobster (voiced by D. Kevin Williams) - An anthropomorphic monster created by injecting a lobster with the DNA of Genghis Khan and Thomas Blood. He was dropped from the series after Season Two. Slash (voiced by Terry Berner) - A swordfish injected with the DNA of villains like Genghis Khan and Thomas Blood like Slobster. Thus, he becomes an anthropomorphic fish with a drill bit on its nose who speaks in a hissing lisp. Slash is usually defeated by immobilization of his nasal drill. He was dropped from the series after Season Two. Killamari (voiced by D. Kevin Williams) - An anthropomorphic squid able to project natural "spears" or "harpoons" from his mouth and the many suckers covering his body. In the episode "Lone Shark," he almost kills Jab with his poison. Lena and Bends concoct an anti-venom which has since reduced his threat. Repteel (voiced by Tony Wike) - The only one of Dr. Paradigm's Seaviates to have originally been human. Mr. Cunneyworth is the aged owner and hotel manager of a run-down hotel accidentally demolished by the Street Sharks during a fight with Dr. Paradigm's Seaviates. As he had nowhere else to go, Mr. Cunneyworth willingly allowed Dr. Paradigm to merge his genetic codes with those of a moray eel and an electric eel. As Repteel, he feeds on electricity and shoots miniature eels (also charged with electricity) from his hands and wears a special pack to store energy. Shrimp Louie (voiced by Andrew Rannells) - A mutated shrimp and one of Paradigm's later Seaviates. He is not very strong, is quite the coward, and his primary weapons are big blaster guns. Maximillian Greco - An aged mafioso who blackmails Dr. Paradigm into gene-slamming him with the DNA of a rhinoceros (upon its nose-hair samples being obtained) and the DNA of a desert tortoise upon learning of his illegal and secret experiments. This granted Greco the strength of a rhinoceros and the longevity of a desert tortoise which rejuvenated Greco to half his real age. He later resurfaced as the owner of a casino. Zeus and Apollo (vocal effects provided by D. Kevin Williams) - Maximillian Greco's pet chihuahuas. Like their owner, they were also genetically enhanced by Dr. Paradigm which made them larger than normal. Malcolm Medusa III (voiced by J. Michael Lee) - A rich, business-owning big game hunter who frequently targets endangered animals. The Street Sharks and Moby Lick expose him. In "Shark Hunt", Malcolm Medusa III traps Moby Lick and the Street Sharks in a hunting enclosure. He is eventually imprisoned in an island prison as he plans his revenge. Clammando (voiced by D. Kevin Williams) - A mutant clam who is Malcolm Medusa III's right-hand man. He started out as a dock worker for Malcolm Medusa III who fell into a toxic waste part of the water where there were clams. As a result upon being fished out by Malcolm, he turned into a mutant clam. In "Shark to the Future," Clammando's appearance was first used as a Seaviate that worked for Dr. Paradigm during the Street Sharks' visit to the future. The Raptors - A trio of rogue Velociraptor-like criminals. Bad Rap (voiced by Doug Parker) - The leader of the Raptors, who has a metal brace-like device on his mouth and a rocket-launcher on his right hand. Haxx (voiced by Doug Parker) - A Raptor with implants on the backs of each wrist that produce green blades, whose tail has been replaced with a blade capable of spinning like a drill. Spittor (voiced by Doug Parker) - The scientist and brains of the Raptors. Spittor carries a tank with various liquids released from nozzles on his hands, tail, and mouth. Guy in the Sky (voiced by Tony Wike) - Fission City's top air radio reporter and paparazzo. He was never fully seen, but recognized by a yellow helicopter. The Guy in the Sky was later dropped from the show after Season Two. Detective Michael Brock - The police detective who investigates the Sharks' activities. He was later dropped from the show after Season Two. Dr. Robert Bolton had invented a gene-slamming device for peaceful uses until his colleague Dr. Luther Paradigm uses it for his evil purposes. When Dr. Bolton tries to intervene, he ends up gene-slammed into an unseen inhuman creature during the struggle and escapes. While in search of their father, John, Clint, Robert, and Coop are mutated into humanoid sharks by the evil Dr. Paradigm. While adapting to their new looks, the four brothers must avoid being seen. Ripster, Jab, Streex, and Slammu must protect their reputations and change the way they are being viewed in Fission City. They must fight Dr. Piranoid as well as finding their father once and for all. Dr. Paradigm captures Big Slammu to control his mind and the Street Sharks must break into Dr. Paradigm's hideout to save their brother. While the Street Sharks are going out for burgers, Dr. Paradigm transforms a squid he has acquired into Killamari who becomes the latest member of the Seaviates. The Sharks have to stop them from breaking into the Bolton home and stealing important genetic research data that their father left behind. When a musician called Melvin Kresnik accidentally digests contaminated popcorn and water that was tainted with a gene-slamming chemical, he becomes a mako shark later known as Rox and befriends the Street Sharks. Together, they have to save the concert in town and its attendants from being mutated into more sea creatures through the same way that Rox was mutated. The citizens of Fission City hear an announcement from Dr. Paradigm that he has invented a vaccine against the gene-slamming formula. With the help of a mind-control serum, Dr. Paradigm turns Jets Taylor into a killer whale mutant named Moby Lick to be his latest Seaviate. When Streex has been captured by Dr. Paradigm, the rest of the Street Sharks alongside Moby Lick take to the roads to rescue him. Rox is back in town for the Fission City Music Awards and plans to play the evidence that would expose Dr. Paradigm's gene-slamming activities. When his hotel had been previously destroyed by the Street Sharks and no family members to live with, Mr. Cunneyworth allows Dr. Paradigm to gene-slam him with the DNA of an electric eel and a moray eel which transforms him into Repteel. While Repteel is ordered by Dr. Paradigm to steal an advanced supercomputer part for his robotic machine, the Street Sharks take a cruise around the city to find the doctor's new Seaviate's location and put a stop to their evil plans. The Street Sharks are framed and brought out of hiding by Sharkbot, the robotic machine built by Dr. Paradigm in the last episode. The Street Sharks must once again defend their reputations and take on Sharkbot. The Street Sharks discover an underground civilization of mutant crocodiles that happen to know Dr. Bolton after he cured them of their damaged genes. Meanwhile, Dr. Paradigm rebuilds Sharkbot and captures one of the mutant crocodiles. Jab and Streex are sent back in time in two different eras by Dr. Paradigm's time machine called the Time Slammer. Back in the present, Slammu, Ripster, and Bends have to deal with Dr. Piranoid's Seaviates who are now joined by Shrimp Louie. With the help of some Atlanteans, Jab is able to travel in time to save his brother Streex. Dr. Paradigm creates Tentakill as part of his time-traveling plot to have Killamari go back to the medieval times and kill the Street Shark's ancestor Sir Thomas Bolton. Ripster and Big Slammu hijack Dr. Paradigm's Time Slammer to prevent Sir Thomas Bolton from being killed. The Street Sharks are sent to a future where Dr. Piranoid controls everything. They meet up with Bends' great-great-grandson General Bendsini and join the rebel forces. The Street Sharks go to Washington D.C. to save President David Horne from being "gene washed" by Dr. Piranoid as part of his plot to control President Horne after he had successfully gene-washed Vice-President Russell. Lena's brother Malik is among those who have been taking strength-enhancing pills. Ripster goes undercover to trace the source of the pills and discovers that a drug dealer named Jackal has been distributing the pills in order to get some recruits to help rob a bank. The Street Sharks have suddenly become human again due to a formula made by Dr. Piranoid as part of a plot to keep the Street Sharks human permanently. While investigating the killer whale attacks, the Street Sharks and Moby Lick trace the attacks to Malcolm Medusa III's marine animal sanctuary called Medusa Cove which is being covered up by holograms to hide the pollution and trapped whales. They discover that businessman Malcolm Medusa III and Clammando have been using holograms to keep the town from knowing what is really happening. Mantaman returns to Earth to help the Street Sharks fight the energy-draining alien (which survived the space station's destruction in "Space Sharks") before it starts draining Earth's electricity. The Stromboli Circus is in town where El Swordo and his swordfish Spike are the main attraction. Spike is soon targeted by Dr. Piranoid so that he can mutate and control it with the Chromifier Ray so that he can gain control of a satellite and control every head of state in the universe. Fission City has suffered a blackout as Dr. Paradigm unveils the Wolverinepedes (a wolverine/centipede hybrid) which will be a solution to Fission City's toxic waste problems. The Street Sharks are contacted by Paxel of the G.E.C.O.s (short for Genetic Engineered Cave Organism) on behalf of Robert Bolton where they learn that toxic waste is leaking into their underground home beneath the garbage dump. The Street Sharks discover that the Wolverinepedes are a cover for Dr. Piranoid's illegal toxic waste-dumping property where the Wolverinepedes have been getting bigger from the consumption of toxic waste. Dr. Paradigm is visited by his future counterpart in his Time-Slammer where they work on a plan to develop a mechanism to alter the world's genetic code by New Year's Eve. The Street Sharks are tipped off about the disturbance in the time-space continuum by Dr. Bolton and work with Mantaman and El Swordo to thwart the two Dr. Paradigms and the future Dr. Paradigm's Mechosharks. An aged crime boss named Maximilian Greco discovers Ripster and Streex fighting Killamari and Repteel at a nearby zoo as part of Dr. Paradigm's plot to obtain animal specimens for his Genetic Engineering Chamber. Upon tracing Killamari and Repteel back to Dr. Paradigm, Maximilian Greco blackmails him into enhancing him with the strength of a rhinoceros and the longevity of a desert tortoise. Maximilian also has Dr. Paradigm have his chihuahuas Zeus and Apollo enhanced to fight the Street Sharks. Malcolm Medusa III and Clammando are back and have been hunting Florida panthers in the Everglades as part of a plot to develop a chemical waste incinerator there. 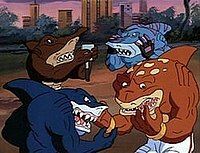 After Moby Lick has been caught by Malcolm when trying to rescue them, the President enlists the Street Sharks to investigate where the trace the Florida panthers and Moby Lick to a nearby island where Malcolm has used a petrifying laser to petrify Moby Lick, the Florida panthers, and other wildlife in the Everglades. Now Malcolm plans to have the Street Sharks provide a hunting challenge for him. Maximilian Greco is back and has established a casino called the Golden Greco while making its surrounding areas as part of Fission City's casino district. Dr. Paradigm sends Repteel and Shrimp Louie to raid the Golden Greco and steal all the money there. Yet Repteel and Shrimp Louie continue to rob other casinos causing Dr. Paradigm to send Killamari after them up to the point where the Seaviants are enlisted by Maximilian Greco to take over the casino district. Dr. Piranoid has Killamari and Tentakill capture Mantaman's younger brother Ryan so that he can get Mantaman to hijack two jets with one of them carrying the Latonian president and the other one carrying the Coachnian president where both of them are to be meeting with President Horne the next day. While Mantaman does the hijacking, Bends and the Street Sharks work on playing along while finding out where Dr. Piranoid is keeping Ryan. During that time, Dr. Piranoid has created the Genesis Satellite to end the world's woes by detonating it so that the world can be turned into mutated creatures. At the time when Jab is going to compete in the Cross-Country Grand Prix, Dr. Paradigm creates the Gene-Slam Bomb and places it in the Turbo Jab vehicle so that it would detonate at the Cross-Country Grand Prix if Jab does not have his car running at 65 MPH. The plot thickens when the International Trade Conference that is signing the Big Trade Agreement is threatened by Dr. Paradigm's Gene-Washing Bomb within an ice sculpture of two dolphins. At the time when El Swordo is entertaining the USS Liberty, a four-headed sea monster (where some navy officers have compared it to Scylla) has been attacking ships and submarines at sea. To prevent an international incident, President Horne enlists the Street Sharks to look into this. The Street Sharks work with El Swordo in order to keep the four-headed sea monster from attacking ships. A space capsule that landed on Earth 65,000,000 years ago has been unearthed by archaeologists. While Dr. Paradigm has taken interest in the space capsule, an incident involving the capsule's prisoner Bad Rap causes Mantaman to fall under his control (the alien whose DNA was used to create Mantaman was one of Bad Rap's many creations) as they plot to control the largest radio telescope in order to contact Bad Rap's fellow Raptors. Now the Street Sharks must work to free Mantaman before Bad Rap's transmission to his fellow Raptors gets through. President Horne contacts the Street Sharks informing them that a UFO has been sighted in the Solar System. Upon investigating, the Street Sharks meet the Dino Vengers T-Bone, Stegz, Bullzeye, and Spike. The Street Sharks learn from them that they are after Bad Rap and the Raptors. The Street Sharks and the Dino Vengers join forces when the Raptors steal different weapons from different countries in order to make the other countries think they are being attacked by the other. While fighting the Raptors, the Street Sharks and the Dino Vengers hear from President Horne that the military is testing their stealth Super Shadow chopper. As the Street Sharks and the Dino Vengers work to protect the Super Shadow from the Raptors, Dr. Paradigm takes interest in the Raptors as he leads Shrimp Louie and Tentakill into finding them where he will steal the Super Shadow for them in exchange for Velociraptor DNA. After Dr. Paradigm obtains the Super Shadow, the Raptors trick Dr. Paradigm by giving him iguana DNA. The Street Sharks and the Dino Vengers must work to reclaim the Super Shadow from the Raptors. During winter, the Raptors make plans to warm up Earth in order to make it more hospitable for the Raptors. They do this by making Mt. Cauldron (a dormant volcano near Fission City) erupt by firing a missile into it so that the heat from it can be trapped in Earth's atmosphere. After the Street Sharks and the Dino Vengers thwart that plan, the Raptors do what they did on Calderas 3 by using their computer to activate every dormant volcanoes on Earth. Now the Street Sharks and the Dino Vengers must prevent the Raptors from activating the dormant volcanoes on Earth. At the time when Big Slammu prepares for Fission City's comic book convention at a local convention center to meet his favorite comic book writer Jake Langstrom, Bullzeye learns about comic books and follows Big Slammu to the convention center. At the same time, the Raptors head to the Munitions and Armaments section of the Convention Center in order to steal the latest weaponry there. When the Street Sharks and the Dino Vengers stop the Raptors from stealing a submarine, Stegz, Spike, and Bullzeye come down with a virus with the same symptoms as the virus the Dino Vengers once contracted on the planet Zirus 10. The Street Sharks and T-Bone race against time and the Raptors to the Amazon Rainforest to get to a special pharmaceutical fungus that would help cure the sick Dino Vengers before its final symptom takes its toll on them in the next 24 hours. In order to track the Dino Vengers to their lair, the Raptors cause havoc at an amusement park and ambush the Dino Vengers where they managed to secretly place a tracking device on Stegz so that they can find the Dino Lair. When the Dino Vengers end up defeated and captured as part of Bad Rap's plot to launch them to the stars in a stolen missile, the Street Sharks must rescue the Dino Vengers before the Raptors can launch the missile they are on. At the time when the World Leaders have come to an agreement not to use biological weapons, the Street Sharks and the Dino Vengers are enlisted to guard a top secret facility that the biological weapons are going to be safely destroyed. In order for the Raptors to prevent the biological weapons from being destroyed, Dr. Paradigm (who is now Dr. Iguanoid) puts the finishing touches on his mind-control chip which they plan to use on Bad Rap's alien creation after freeing it. This leads up to Dr. Iguanoid releasing the other alien in the facility as part of his plot to rule Earth. In late September 2012, Mill Creek Entertainment announced they would release the series to DVD during early 2013. On February 19, 2013, Mill Creek Entertainment released Street Sharks – The Complete Series on DVD in Region 1 for the very first time. This release has been discontinued and is out of print. On January 16, 2018, Mill Creek Entertainment re-released the complete series to DVD in Region 1. 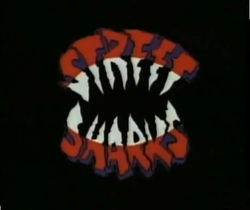 There was a direct-to-video feature film of the Street Sharks with all of Season 1's episodes, Sharkbait, Sharkbite, and Sharkstorm that were combined into one titled The Gene Slamming Begins. It was then followed by two episode movies using episodes from Season 2. One was Shark Quest with two episodes, Shark Quest and Lone Shark, and the other was Shark 'n' Roll with two episodes, Shark 'n' Roll and Fresh Water Shark. In 1996, Archie Comics released a short-lived comic book series based on Street Sharks. They published a three-issue mini-series which were based on the first three episodes of the series, and a regular comic series, which lasted three issues. From 1994 to 1997, Mattel released a line of Street Sharks action figures. ^ "Street Sharks - Sharkbait" on YouTube. Retrieved May 23, 2017. ^ "Amazin' Adventures on". Tv.com. Retrieved 2011-03-13. ^ David Lambert (25 September 2012). "Street Sharks - DVD Plans Come to Light for the Popular Mid-'90s DiC Animated Series". TV Shows on DVD. Archived from the original on 26 January 2018. Retrieved 26 January 2018. ^ "Street Sharks DVD news: Announcement for Street Sharks – The Complete Series". TVShowsOnDVD.com. 11 December 2012. Archived from the original on 25 October 2015. Retrieved 14 October 2015. ^ "Street Sharks - The Complete Series". TV Shows on DVD. 19 February 2013. Archived from the original on 26 January 2018. Retrieved 29 December 2015. ^ David Lambert (18 October 2017). "Street Sharks - Swimming Back to DVD: 'The Complete Series' from Mill Creek". TV Shows on DVD. Archived from the original on 19 October 2017. Retrieved 19 October 2017. ^ "Street Sharks - The Complete Series". TV Shows on DVD. 16 January 2018. Archived from the original on 26 January 2018. Retrieved 26 January 2018. ^ "Street Sharks (mini series) (1996)". Comic Book Database. Retrieved 17 August 2009. ^ "Street Sharks (1996)". Comic Book Database. Retrieved 17 August 2009. ^ Lifestyles: Street Sharks are Chompin' Good!. Electronic Gaming Monthly. Issue 69. Pg.137. April 1995.